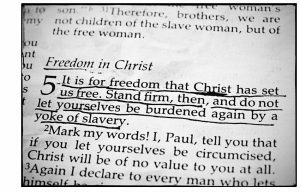 5 It was for this freedom that Christ set us free [completely liberating us]; therefore keep standing firm and do not be subject again to a yoke of slavery [which you once removed]. I want to begin this blog by saying this, “God does not owe us anything”. We have come to a place in our American culture where we think that we are owed something. We have the mentality that since we are born again that God somehow now owes it to us to “keep” us. If He keeps us, it is not because He owes us, He keeps you and me because He loves us. It is a fact that we expect God to do everything for us without us having to move, but this is not the case. We are His people and as such we have been promised the victory, but that does not mean that we will never have to pick up the sword and fight. I cannot have the victory over the enemy if I am content to be a couch potato. If it seems good to me to sit at home and be fed by that TV, or by that phone without ever having to get up and put on the whole armor of God then I am doomed to be defeated. omen anywhere, in the physical or spiritual. Laziness has plagued the church, and procrastination has crippled it. We put off for tomorrow what we needed to deal with today. This is not a diet or meal plan that we are messing with, this is your eternal life that is at stake. We must arise in this final hour and be what His word says we should be and that is soldiers of the cross. Do not be subject again to a yoke of slavery. “Be ye Holy, as I am Holy”, is a scripture verse that we run away from because it is too hard. I cannot be Holy and that is a fact, but this scripture is, in fact, saying “strive to be Holy, as I am Holy. A man or woman of God who is striving to be Holy has no time to turn around in this race and see what’s going on behind them. They have no time to mess with this world and its philosophy, but rather they run this race striving for Holiness because He is Holy.